Sofia is the height of ladylike sophistication. "Catch the Bouquet" has been watching the watching the wedding trends swing back from flashy to fabulous with Italian screen siren glamour making a much-awaited return to a bridal aisle near you! Sofia is a classic slim-line sheath gown, decorated with lightly beaded lace and a whimsical beaded slanted belt waist. And of course, her matching cap-sleeved bolero jacket is the final elegant and timeless touch. It's a modern nod to the eternally stylish wedding gown like that of Jackie O and Princess Grace Kelly. Bella has more photos of Sofia and would be delighted to email them to you. Simply ask her via email from the 'Contact Us' page. Be sure to check out the photos to get up close to her amazing details! We do have larger photos of all of our gowns available, please contact Bella via the 'Contact Us' page and we'll send them to you. Well, that part is easy. 1). 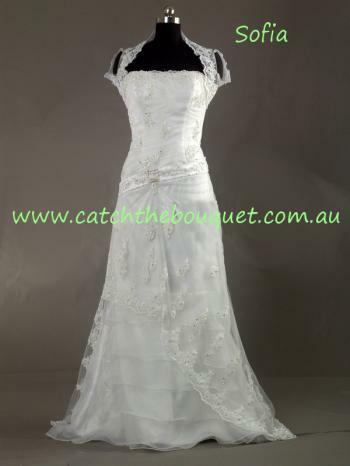 Simply purchase the dress that you love and make payment through our secure checkout. 2). You will receive an email from Bella with a detailed list of body measurements you will need to supply. Take the measurements and check them carefully - the better the measurements, the better the fit of the finished article! 3). Relax while Bella and the seamstress prepare the dress to your exact measurements. Depending on the level of detail on the dress, this will take between 12-18 weeks. Bella is available at all times via email and will be in touch during the process to let you know how your dress is coming along! 4). 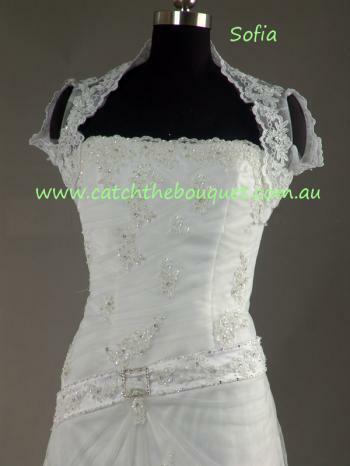 Your dress will be posted to you as a registered and insured parcel to ensure maximum safety for your dress. 5). She's in your arms. You're very own custom-made dream dress at just a fraction of the price of bridal salons and department stores! 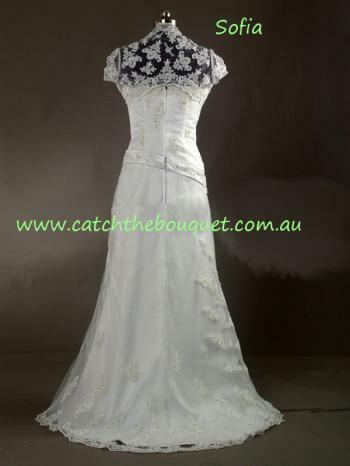 And that's exactly how easy it is to get your dream dress from www.catchthebouquet.com.au!